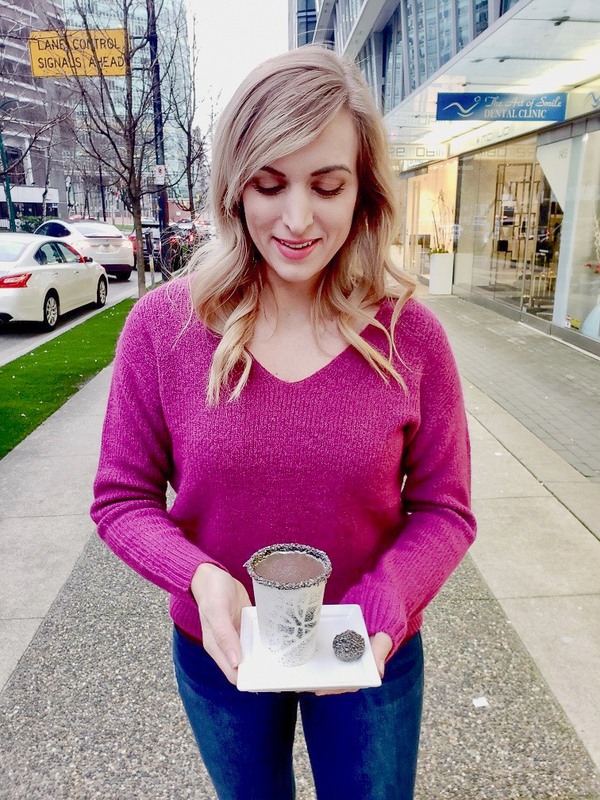 The Vancouver Hot Chocolate Festival is one of the sweetest festivals ( no pun intended) that we have here in Vancouver, BC. For this festival, which runs until February 14th, some of Vancouver’s best chocolatiers, pastry shops, cafes, etc. participate and create unique hot chocolate drinks to serve during the festival. There are 30 participants this year and the hot chocolate creations are incredible! Because there are so many great locations with so many great hot chocolates, you can’t possibly get to them all. 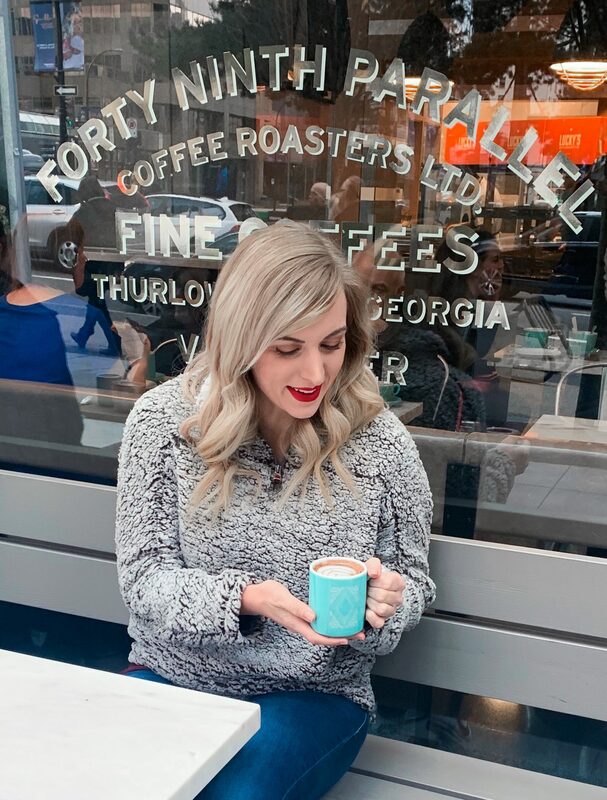 Today I wanted to share with you 3 participants that I loved whose hot chocolates I highly recommend you check out before the 14th! 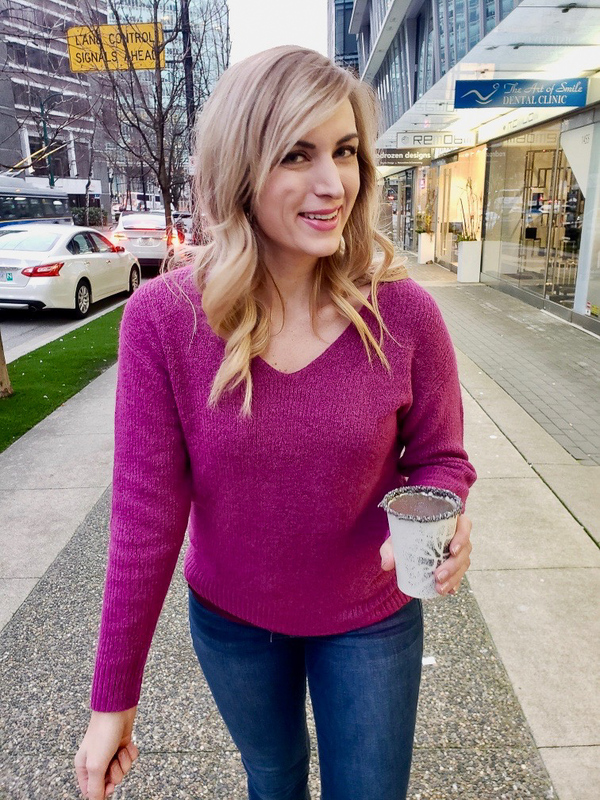 Also, for those of you not in Vancouver and therefore not able to attend this sweet event (.. sorry for the pun again, I can’t help myself lol) I wanted to share a few must-have sweaters. 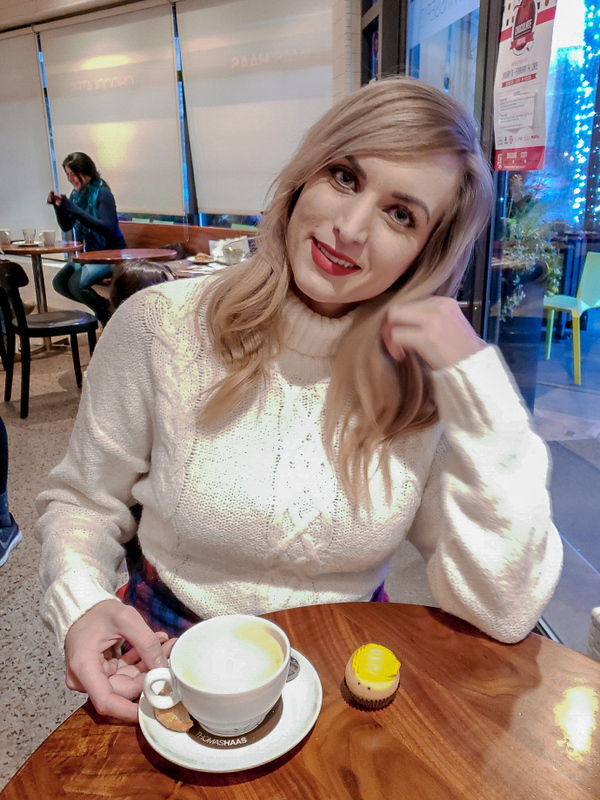 For each hot chocolate event below I am wearing a different cozy sweater that I can’t recommend enough for this season. A Vancouver mainstay, 49th parallel never fails on it’s coffee & donuts. 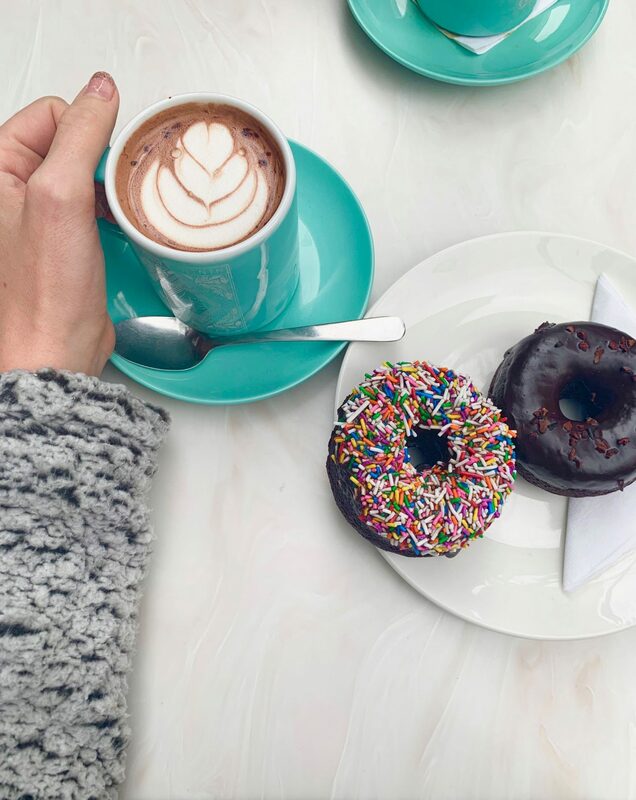 What’s really exciting is that for the first time ever for the Vancouver Hot Chocolate Festival they have a vegan donut (and hot chocolate). The vegan hot chocolate, called the ‘Chocolate Power Plant’ is made with either vegan almond or vegan hazelnut milk. They’ve also got a dark hot chocolate for the non-vegans and both come paired with a donut. I went with the vegan hot chocolate with the hazlenut milk and it was amazing. They have a vegan chocolate glaze and sprinkle donut and I had a bite of each. They were so, so delicious. I’m not sure if they’ll be keeping the vegan donuts beyond the end of the festival; so be sure to get yours before February 14th! This pastry boutique is a tiny hidden gem. They are best known for their macarons; which are incredible. 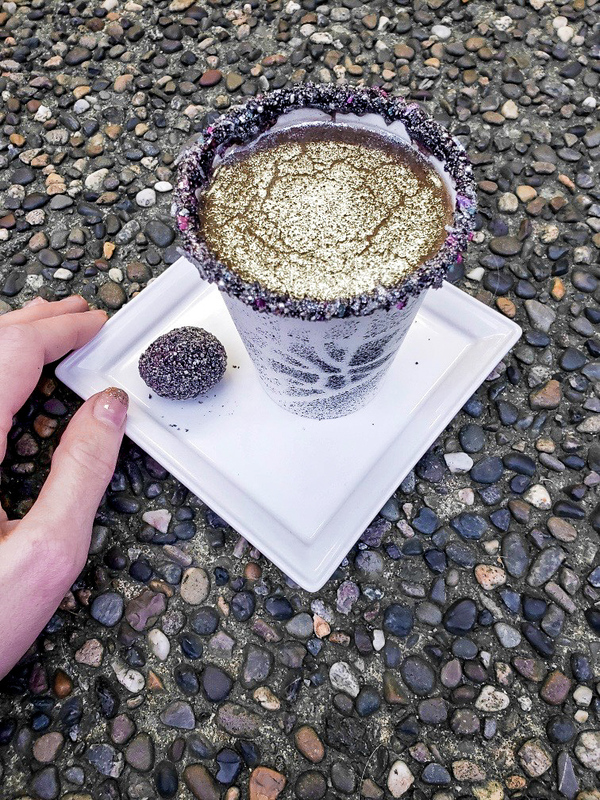 For the Vancouver hot chocolate festival this year they have two creations- “mining for vibranium” which is a coconut and black sesame hot chocolate; and, “the dazzling mermaid” which is a blueberry cheesecake white hot chocolate. 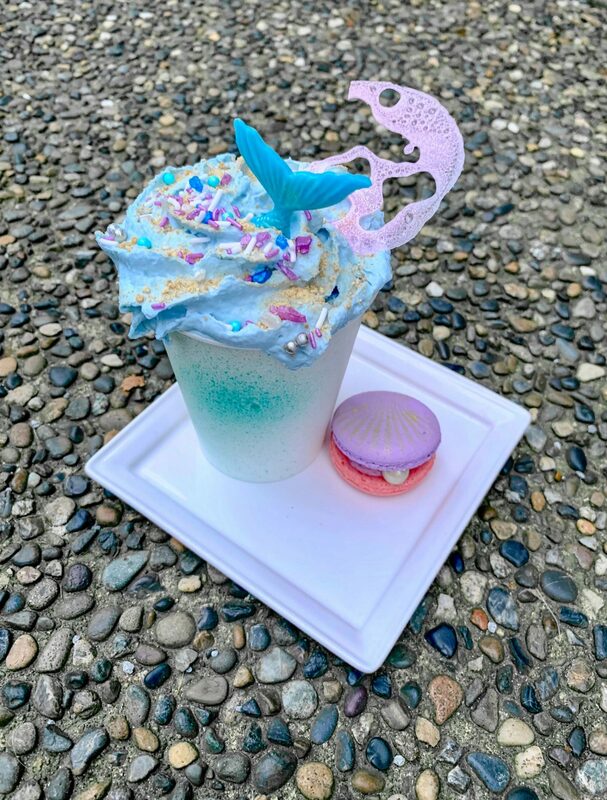 Soirette’s hot chocolate festival entries are always all about the presentation; and this year is no exception – check these out! Honestly, I am sad to say that these were not my favorite hot chocolates of the festival. They both look better than they taste in my opinion. The 49th parallel and Thomas Haas options are better hot chocolates with less fancy decoration. The last participant in Vancouver’s Hot Chocolate festival that I tried and want to recommend is Thomas Haas. They, like 49th Parallel and Soirette, have two hot chocolates for the festival. 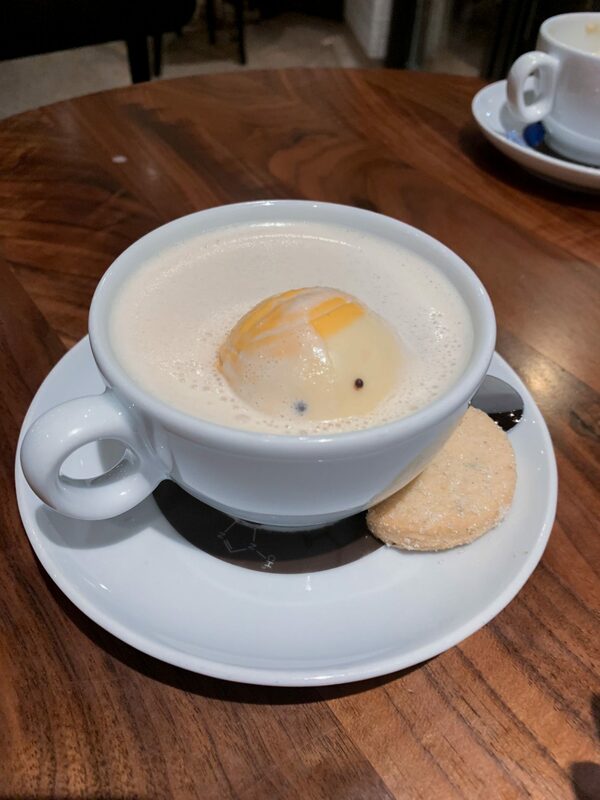 The first, called “There is Hope” is a milk chocolate and passion fruit hot chocolate. The second, which is really what I came here to tell you all about, is “You’re Fired”. 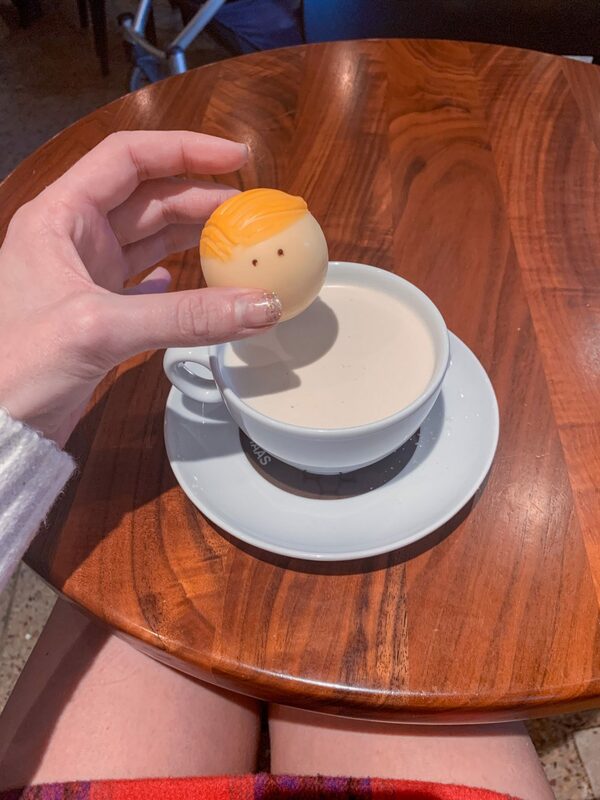 Based on the Time Magazine cover showing Donald Trump from the neck down underwater, they created this anti-Trump hot chocolate where his “head” is a chocolate ball that you “dump” in your hot chocolate. It melts to reveal a marshmallow. 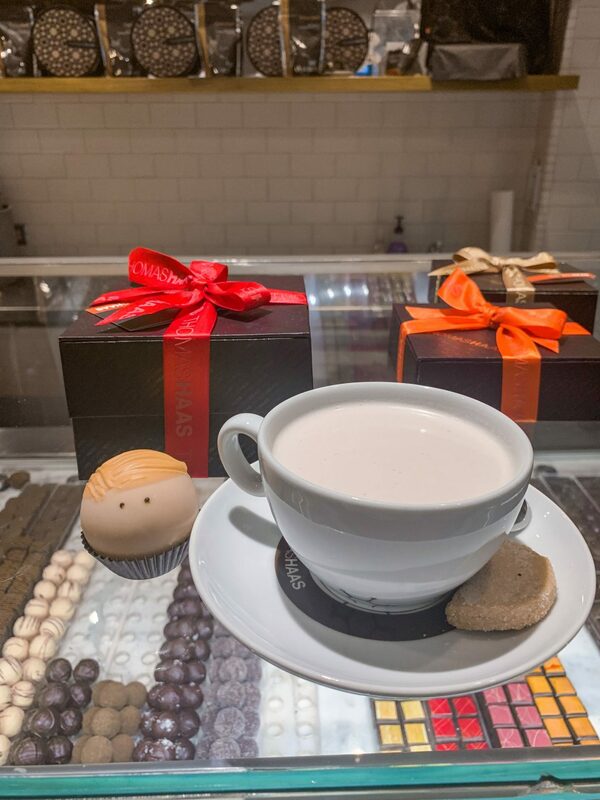 With 15 days left of the Vancouver Hot Chocolate Festival, you have plenty of time to get your hot chocolate fix on. For more info on the whole festival check out their website. Now; on to cozy sweaters!! 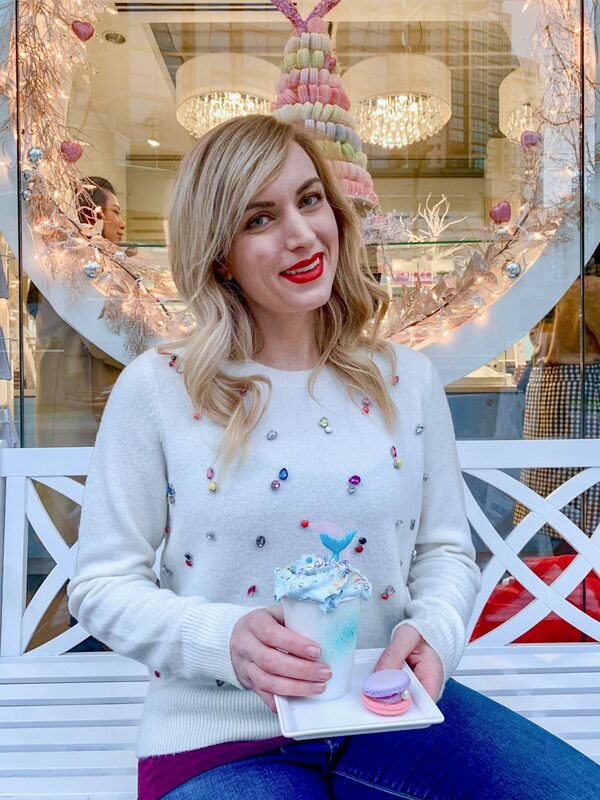 I wore 4 sweaters to these 4 hot chocolate try-outs that are must-have sweaters for winter. This is the coziest thing I own. I repeat; the coziest thing I own. Right now, it’s on sale for 35% off, so get yours ASAP! Such a pretty sweater that makes any outfit without any extra work. It’s a great way to brighten a winter’s day! Right now it is 50% off!! The raspberry shade is in this season, and a v-neck is nice change from turtlenecks, so it’s great to have in your sweater collection. This is a great ‘go with everything’ sweater; and it’s really quite soft. It does run large though, so definitely size down 1 size! Oh my gosh, a hot chocolate festival!? I need to visit right away, that is my favorite winter drink. They look so cute, and I’m loving all the sweaters! Haha yes you do! Isn’t it such a cool idea for a festival to brighten up winter!! Hot chocolate festival?! Now this sounds amazing!! Right!! Definitely one of my favorite events here in Vancouver. Hot Chocolate festival!? That sounds like my kind of event! These are all so creative! Oh my! I need to travel there just to go to Soirette! Those hot cocoas are BEYOND amazing looking! I need the mermaid one in my life! Aren’t they cool looking! The whole shop is really cute and the macarons are incredible! Oh Em Gee! A hot chocolate festival. I am literally looking up whether they have one near me because this one looks amazing and everything looks so appealing. Haha love it! Did they end up having one near you!?!? ok this festival sounds SO amazing! so cool that you all have that! A hot chocolate festival sounds amazing during the Winter and these hot chocolates you featured were amazing! OMG I want to go haha. Come visit Vancouver!! It’s an awesome city! Okay I need to go here! Hot chocolate is my absolute favorite! Hot chocolate festival? Sign me up! It’s one of my favorite cold weather drinks. BRB while I go make some! Haha right! It’s such an awesome idea for a festival. You had me at hot chocolate festival. Like, yes please! These bevs look sooo yummy! Haha they are definitely awesome! Oh how awesome! Love the idea of a hot chocolate festival! Wow, these hot chocolates are amazing and beautiful! I LOVE the anti-Trump one. I wonder if they would ship them! Isn’t it cool?! And i know, they really should! Somewhere in the states clearly needs to start making them for you guys!! OMG how fun!!! I want to go to a hot chocolate festival!!! So jealous! Haha right! It’s such a fun event! I wish we had a hot chocolate festival. The sweaters you shared are adorable!